You have most certainly noticed that your camera screen interface as well as your image-processing software both dispaly a histogram. What is it for? What does it show? How should you interpret what it displays, and what kinds of actions must you take to correct your images? 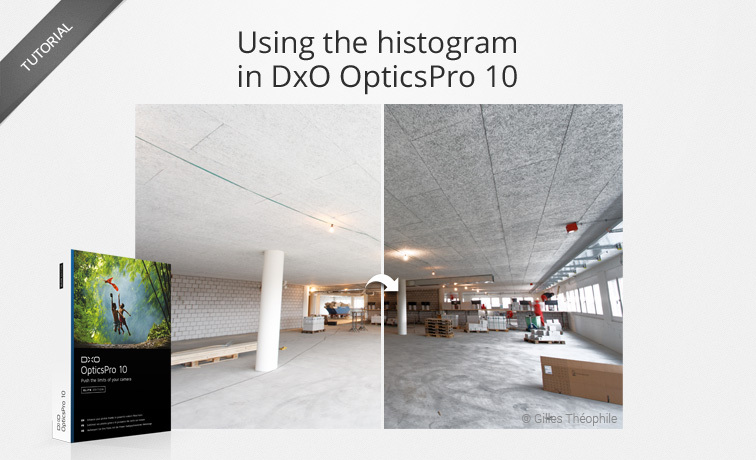 We will discuss all of these things in this tutorial dedicated to using the histogram in DxO OpticsPro, using simple and concrete examples of the kinds of situations you will face when correcting your images. 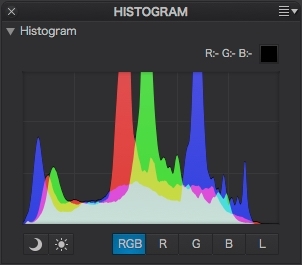 The histogram is a graphic representation of the brightness of your image that will help you determine if your photo (or part of your photo) is correctly exposed, underexposed (too dark), or overexposed (too light). 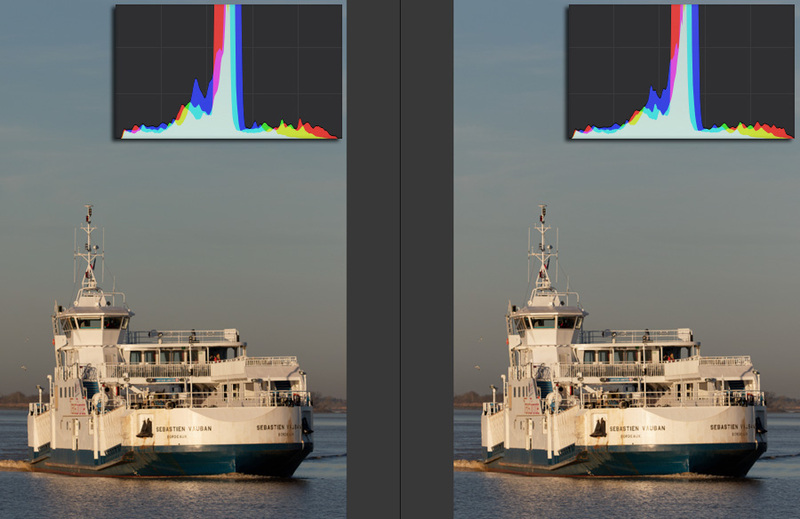 By correctly analyzing what the histogram is showing you, you will be able to use DxO OpticsPro’s specialized tools to make appropriate corrections to the brightness and contrast in your images. 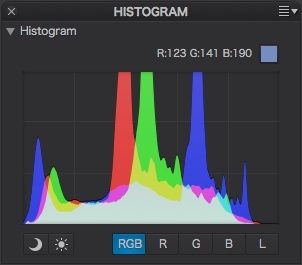 The graphic information in histogram is displayed as ridges that spread from right to left, starting from black and going through the midtones and then to white. Each peak indicates the number of pixels for a particular level of luminosity: the higher the peak, the greater the number of pixels for that brightness level. Thus the histogram indicates the tonal range of your image, from its darkest to its lightest elements. But it is also capable of showing you clipped values — that is, the parts of your image that are so dark or so bright that they surpass the tonal range, which means that there has been a partial or total loss of image information. 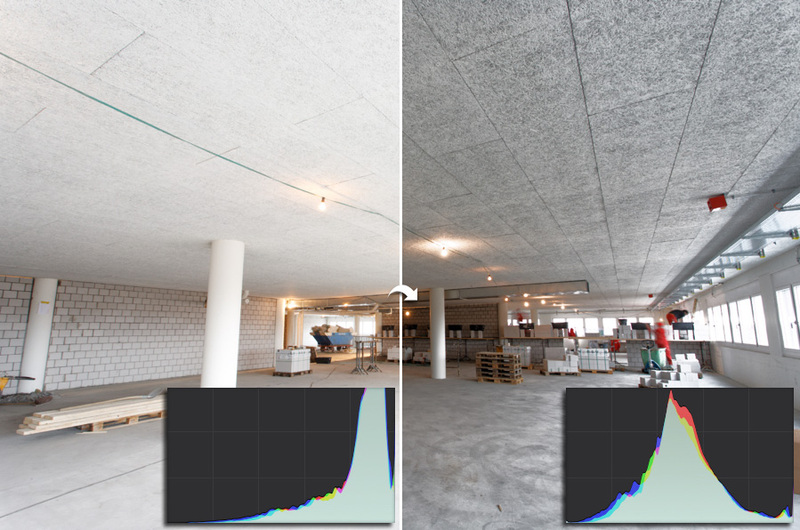 If it is a partial loss, DxO OpticsPro contains certain algorithms that can help reconstruct the lost information in the highlights and blacks. All channels (RGB button): Displays all of the channels together — Luminance, Red, Green, and Blue, as well as additive synthesis elements (for example, cyan, which overlaps the blue and green channels). Red Channel (R button): Displays the brightness levels of the red channel only. Green Channel (G button): Displays the brightness levels of the green channel only. Blue Channel (B button): Displays the brightness levels of the blue channel only. Luminance Channel (L button): Displays the Luminance channel, shown as gray in the histogram. Specifically, you will make use of only the RGB mode or the Luminance mode by themselves, for the simple and practical reason that you know that your image as already been immediately corrected by the DxO Standard preset and its DxO Smart Lightingcomponent. Finally, if you move the mouse pointer around in the image, the RGB light levels (from 0 to 255) will be indicated at the top right over the the histogram. For example, a pure white displays the value of 255 per channel, whereas a pure black is 0 per channel; medium gray is 128 per channel. The small square displays the color of the place over which the mouse pointer is hovering. Why do we talk about brightness levels by channel using a scale of 0 to 255? This convention is based on an old computer principle that a pixel is represented by an 8-bit byte, so the maximum number of colors is 2 (a 0 + a 1) to the eighth power (i.e., 28), or a maximum level of 256 per RGB channel. In reality, your RAW files are quantified to 16 bits, or 65,536 levels. Toggle shadow zones: clipping in the dark areas of the image. 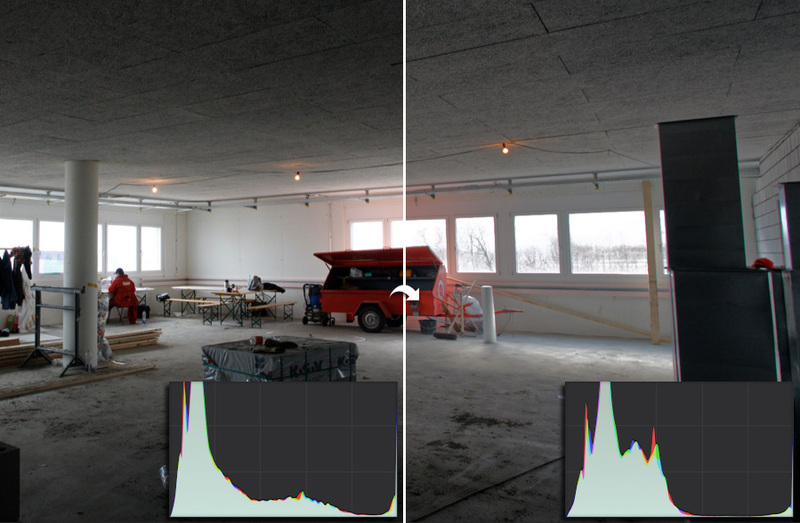 Toggle highlight zones: clipping in the bright areas of the image. The ends of the histogram are brought within the tonal range limits. The color masks disappear, or at least are reduced as much as possible. 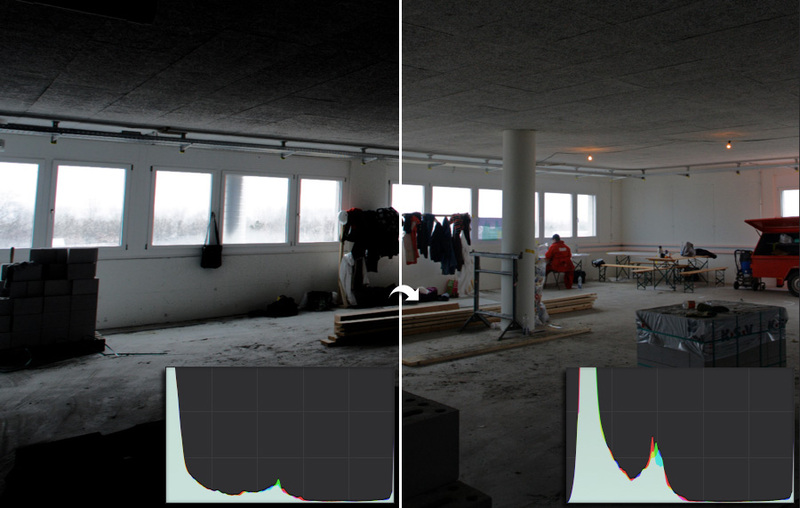 An image can be considered as corrected exposed when the tonal range is well distributed in the histogram, without clipping, or with clipping limited to those areas which cannot be recovered (as with the face of the sun or car headlights). 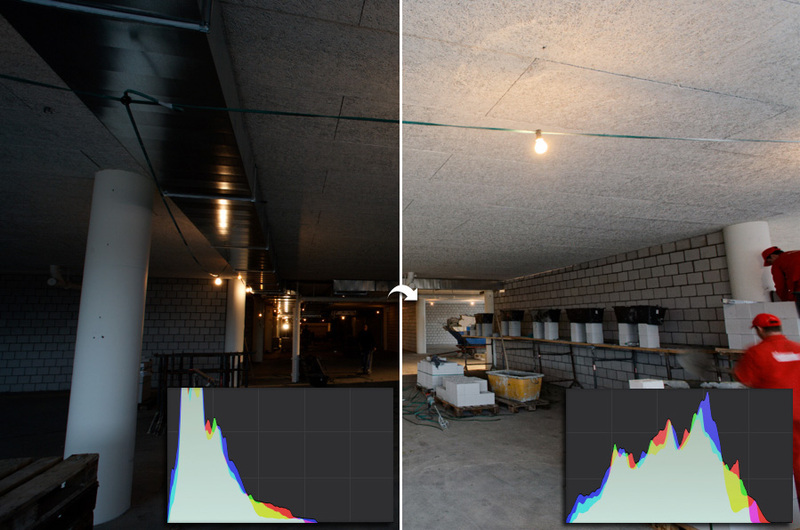 In such cases, your image will require little intervention, mostly limited to giving a bit more force to its overall brightness, either using DxO Smart Lighting and its different automatic settings (Slight, Medium, Strong), or manually with the various available tools (Selective tone, Tone curve, etc.). 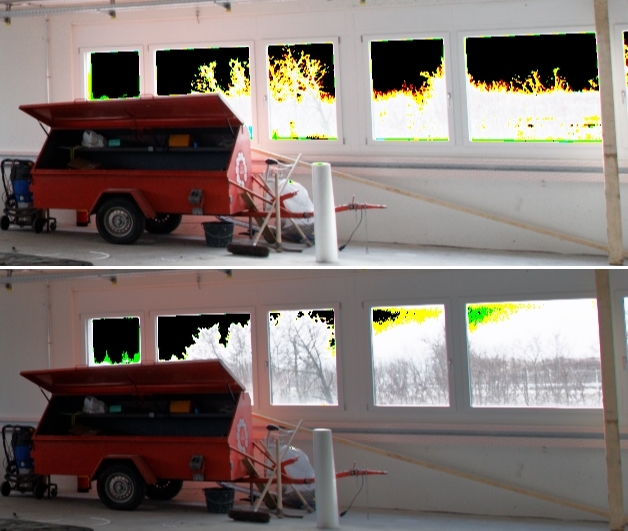 An underexposed image is too dark, with the histogram shifted to the left, and an overexposed image is too light, with the histogram shifted to the right. 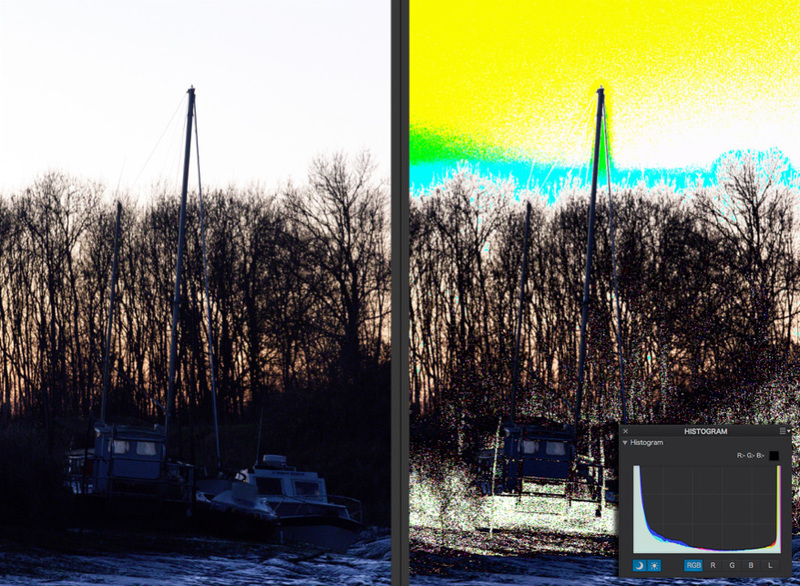 But you can also have an image that can have both overexposed elements and underexposed elements, which results in a histogram that has a trough in the middle and two peaks at either end. 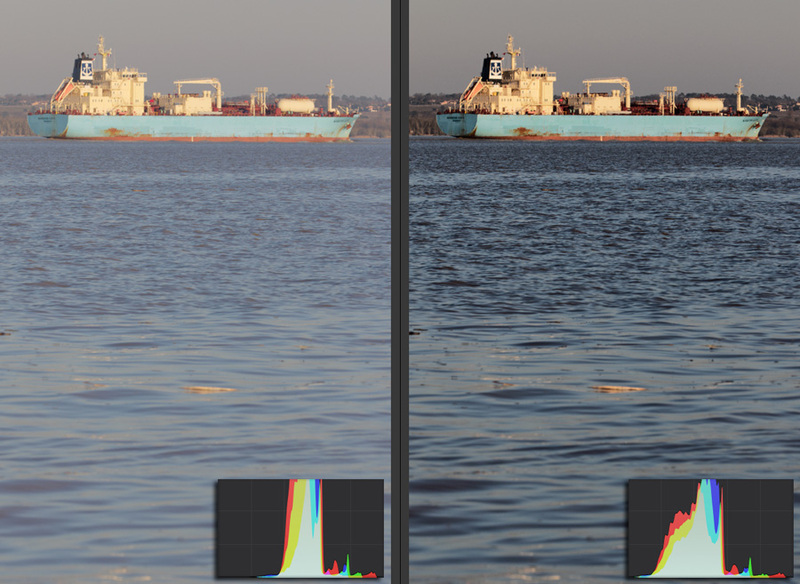 Be careful not to confuse an underexposed or overexposed image with a well-exposed image that contains dark or light elements that are displayed as peaks in the histogram. Here again, the automatism of DxO Smart Lighting will provide a satisfactory correction that you can always refine or adjust manually according to your own tastes. Do not introduce clipping, as you will lose valuable image information. Determine what the principal subject of your image is, in order to adjust the exposure accordingly. Do not distort the atmosphere of the original scene by trying, for example, to excessively brighten the shadows. 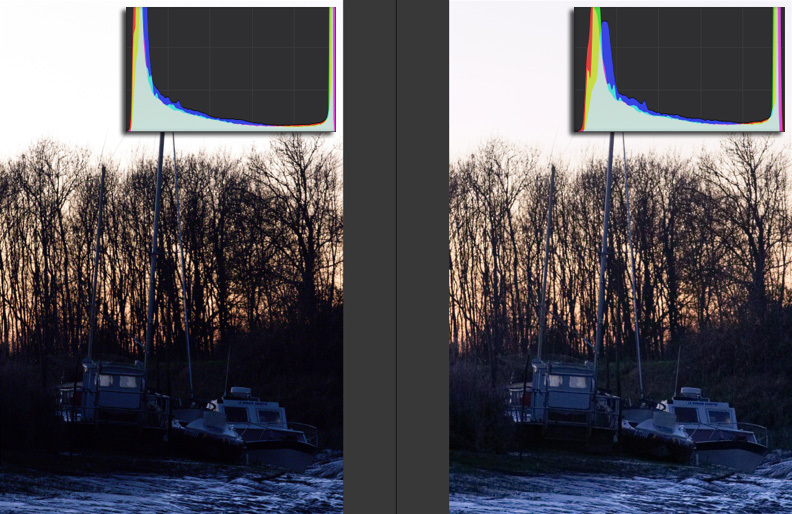 An image with clipped areas is not a problem in and of itself, so long as the midtones remain usable and that the clipping does not detract from the principal subject and the overall image. Clipped vlaues are indicated by peaks packed at the extreme ends of the histogram: clipped blacks to the left, clipped whites to the right. 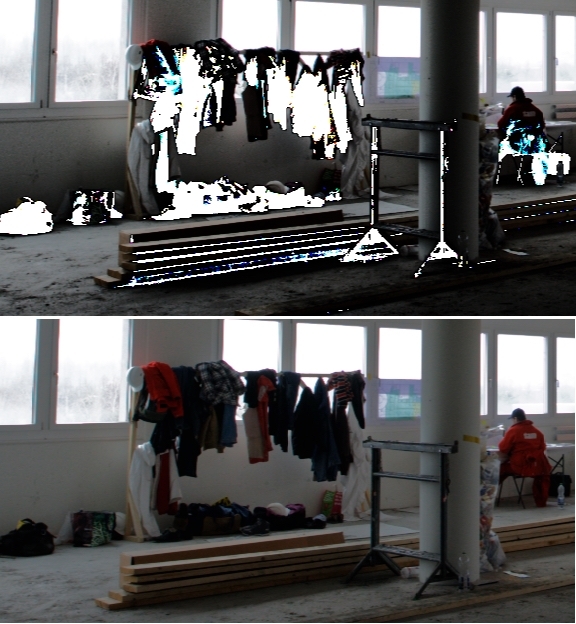 Note that the same image can contain clipped values for both blacks and whites! Do not try to recover certain kinds of clipped elements, such as the black at the bottom of a well, or bright reflections on water. Give priority to your principal subject, and too bad if that means there are clipped elements in the rest of the image. Activate the display of clipped areas (both dark and bright) to help you with your corrections.